Coverage of environmental issues may include climate change, pollution, environmental degradation, and resource depletion etc. Several articles on the site argued against the theory of evolution, for example, and at least one dismissed the overwhelming scientific consensus on global warming. Later, through tax documents and interviews, I would learn that all of Inference‘s funding came from a surprising source: Peter Thiel. Since Inference’s start, Thiel, a prominent Silicon Valley venture capitalist, has donated at least $1.7 million to the outlet. Those tax returns reveal that Inference’s entire operating budget came from $1.7 million in donations during its first three years (through August 2017, the latest reports available). These donations came from a single donor: Auzen LLC. Looking at corporate tax reports and other registration documents, it’s unclear whether Auzen LLC and another entity, Auzen Corporation, are involved in activities other than funding Inference. But those documents make it clear that Auzen LLC and Auzen Corporation are run by the same people — and they also state that the sole director of Auzen Corporation is Peter Thiel. Thiel, whose net worth is estimated at $2.5 billion, is among the best-known venture capitalists in the world. In addition to co-founding Paypal, he was an early investor in big tech companies including Lyft, AirBnB, LinkedIn, and Facebook, where he is also a board member. Thiel is also the chairman and co-founder of Palantir, a CIA-backed data science company that analyzes surveillance from many U.S. government intelligence services. Researchers say air pollution may increase risk of autism. Two studies concluded there may be a link, but more research is needed. One study, published in JAMA Pediatrics, studied 132,000 births in Vancouver, Canada, from 2004 to 2009. Researchers concluded there was a link between exposure to nitric oxide from car exhaust during pregnancy and greater incidence of childhood ASD. If the Democrats were smart, they would hammer this talking point over and over, despite it not being scientifically proven (yet). Take a page from the GOP/NRA playbook, and link the EPA’s (original) mission of clean air for everyone vs. pollution created by coal/chemical plants being encouraged to pollute so as to make more profits. Say it a million times, say it unprompted. Say the Trump admin is knowingly causing autism by their deregulatory fever, etc. Kroger Co. plans to eliminate plastic shopping bags from its supermarkets, the latest retailer to address customer backlash against disposable packaging and utensils. The largest U.S. grocery chain by stores and sales said Thursday that it would remove single-use plastic bags from its 63-store QFC chain in the Pacific Northwest next year and eliminate them from all 2,800 Kroger-owned stores by 2025. “This is the way things are headed and we figured we should be in front of that,” said Jessica Adelman, Kroger’s group vice president for corporate affairs. Interfering with the formaldehyde study is one of several steps Trump’s EPA has taken to side with the businesses the agency is supposed to regulate and undermine the agency’s approach to science, critics say. Public health advocates also expressed alarm after Pruitt replaced academic scientists with industry advocates on the agency’s influential science advisory boards and sought to limitthe types of human health research the EPA can rely on in rulemakings. Just out of morbid curiosity, I googled formaldehyde manufacturers, and one of the first to come up is Georgia Pacific. You may recall their owner: Koch Industries. The EPA stonewalling makes a lot more sense now, doesn’t it? Our research has uncovered very strong ties between Georgia-Pacific, a company co-owned by David Koch through Koch Industries, and a political lobby group called the Formaldehyde Council that is involved in efforts to downplay the dangers posed by formaldehyde to human health. But this determination by top scientists and researchers has not stopped Formaldehyde Council Inc. from trying to convince lawmakers on Capitol Hill that the links between Formaldehyde and cancer are highly overstated. David Koch’s company, Georgia-Pacific, one of the largest manufacturers of Formaldehyde in the United States, is listed on the Formaldehyde Council’s website as a “member” since at least 2004. We need to have leaders in the EPA who actually care about protecting the environment, and our health, and not the profits of polluters like the Koch family. The Environmental Protection Agency on Tuesday barred reporters from three news organizations from an event on the impact of toxic chemicals on drinking water at the agency’s headquarters. The event, during which the E.P.A. administrator Scott Pruitt declared that addressing the impact of a class of man-made chemicals was a “national priority,” came at a time when Mr. Pruitt is the subject of at least 12 federal investigations. Among those denied entry from the morning session of the planned two-day event was a reporter from The Associated Press, Ellen Knickmeyer. When she requested to speak to an E.P.A. public affairs official, she was “grabbed by the shoulders and shoved out of the building by a security guard,” according to a report from the wire service. Also turned away were Corbin Hiar, a reporter for E & E News, and Rene Marsh, of CNN, along with a camera operator and a producer from the cable network. How is that even acceptable behavior for a thug like Scott Pruitt? In a normal administration, Pruitt would have resigned in disgrace as soon as this despicable action became public, but then in a normal administration, Pruitt would have been fired long ago. What was the topic that Pruitt wanted hidden? How polluted our national water supply is, specifically in this case by perfluorinated compounds (PFAS), used mostly in teflon and fire-fighting foam. MAGA, I guess. Probably good news for Nestlé ? The former coal-fired power plant in Little Village is set to be demolished and replaced with a 21st-century use: warehouses to speed orders for online customers in Chicago. Northbrook-based Hilco Redevelopment Partners has bought the former Crawford Power Generating Station as part of a $100 million-plus project to demolish the facility and replace it with up to 1 million square feet of warehouses along Interstate 55, Pulaski Road and the Chicago Sanitary and Ship Canal. No tenant has been signed. The facility was one of the last two coal plants in operation in Chicago until 2012, when power company Midwest Generation closed the facility and its Fisk generating station in Pilsen. The Crawford plant opened in the 1920s. Site cleanup and demolition is expected to take 14 to 24 months. Hilco will talk with prospective tenants during that time. Hilco has been buying and redeveloping similar sites in other parts of the country, including Boston and Baltimore, as online retailers and other companies seek “last mile” distribution centers close to residential areas. The company signed leases with Amazon, FedEx Ground and Under Armour on a former Bethlehem Steel plant it is redeveloping into distribution space in Baltimore. Good news, I guess, though I hope they use permeable pavement. Would have been nicer if that area had become a beautiful parkland instead of warehouses. But, still better than a heavy metal spewing power plant, especially if the site is cleaned thoroughly. In a much-watched case, a Michigan agency has approved Nestlé’s plan to boost the amount of water it takes from the state. The request attracted a record number of public comments — with 80,945 against and 75 in favor. Nestlé’s request to the Michigan Department of Environmental Quality to pump 576,000 gallons of water each day from the White Pine Springs well in the Great Lakes Basin was “highly controversial,” member station Michigan Radio reports. But despite deep public opposition, the agency concluded that the company’s plan met with legal standards. Under the plan, Nestlé will be approved to pump up to 400 gallons of water per minute from the well, rather than the 250 gallons per minute it had been extracting. The company first applied for the new permit in July 2016. Water is a complicated and sore subject in many areas, but in few places more so than in Michigan, where a crisis has raged for years over high levels of lead and other dangerous heavy metals in the water in Flint. And back in 2014, Detroit resorted to shutting off water to thousands of customers as it fought bankruptcy. With that recent history as a backdrop, Nestlé’s plan to boost the amount of water it takes from the Great Lakes State drew attention and added another dimension to a debate over whether water should be seen as a commodity, a commercial product — or a human right. Nestlé’s well is in western Michigan, near the town of Evart…The company bottles the water for sale under its Ice Mountain label. Disgusting, really that Nestlé gets to sell, for profit, water that is taken from the public at a rate of 400 gallons a minute. By my quick math: 400 gallons x 60 minutes x 24 hours x 365 days= approximately 210,240,000 gallons a year; roughly 1,681,920,000 Iron Mountain 16 ml bottles that are sold for $3.99 in airports, or cheaper at, for instance, Target). Even accounting for the costs of “extraction”, plastic bottles, shipping, labeling, and so on, that’s a damn nice profit margin. Almost 2 billion 16 ml bottles a year, for basically free! in Mecosta County, Nestlé is not required to pay anything to extract the water, besides a small permitting fee to the state and the cost of leases to a private landowner. In fact, the company received $13 million in tax breaks from the state to locate the plant in Michigan. The spokesperson for Nestlé in Michigan is Deborah Muchmore. She’s the wife of Dennis Muchmore—Governor Rick Snyder’s chief of staff, who just retired and registered to be a lobbyist. Private profits from public resources, despicable. And the Republican assholes currently running the State of Michigan are happy to do it. What I Need I Just Don’t Have. Any other president would have fired him. Mr. Trump praises him. One frequently overlooked truth about Mr. Pruitt amid these complaints is that for all his swagger he has actually accomplished very little in terms of actual policy — a wholly desirable outcome, from our standpoint. While hailed as the administration’s foremost champion of deregulation, he has yet to kill or even roll back any significant regulations that were in place when Mr. Trump came to office. (The Obama administration’s important Clean Power Plan to reduce greenhouse gas emissions from power plants had already been blocked by the courts.) He has delayed a few rules, but even these delays have been overturned or challenged. Most of his actions are in the proposal stage, and many will not be finalized for years, if ever. Tough competition, indeed, but Pruitt is easily in the competition for worst Cabinet member. By endless repetition, he has reinforced in the public mind the lie that Republicans have peddled for years and Mr. Trump’s minions peddle now, that environmental rules kill jobs, that limiting carbon dioxide emissions will damage the economy, that the way forward lies not in technology and renewable energy but in digging more coal and punching more holes in the ground in search of oil. And, on the human level, he has been in the forefront of the administration’s shameless effort to delude the nation’s frightened coal miners into thinking coal is coming back, when any comeback is unlikely not because of regulation but because of strong market forces favoring natural gas and renewables. Was that in doubt? Confusing, isn’t all the content published by the NYT related? 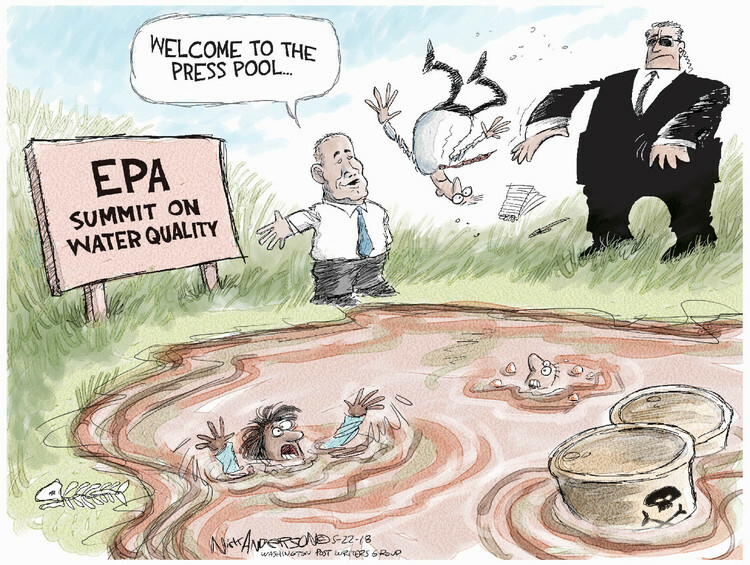 Surprising nobody, the EPA and Texas governor are sweeping any discussion of toxicity under the concrete. Disturbing, and portent of massive human misery to come, especially if the GOP controls the environmental inspectors. Profits over people, always, is the Republican agenda. Fascinating story about a new line of anti-environmental attacks from the Kochs, and the ensuing counter-attack from religious people. We only have on Earth, let’s keep it habitable, and not exploit it for money for a few, leaving our planet despoiled. As a sea of hands waved through the air as eyes closed in prayer, what many in the crowd didn’t know was that they were the target of a massive propaganda campaign. One of the event’s sponsors was a fossil-fuel advocacy group called Fueling U.S. Forward, an outfit supported by Koch Industries, the petrochemicals, paper, and wood product conglomerate founded by conservative billionaires Charles and David Koch. Foxconn, not content to slurp up all the cash in Wisconsin, is now seeking to drain Lake Michigan. Sure the Great Lakes have a lot of fresh water, but why allow it to privatized? And polluted? Foxconn’s bid for Lake Michigan water is the latest test of the decade-old Great Lakes Compact, an agreement among the region’s states intended to make it almost impossible to direct water outside the natural basin of the Great Lakes unless it is added to certain products, such as beer and soft drinks. Of the 7 million gallons of water withdrawn daily for Foxconn, 4.3 million gallons would be treated and returned to the lake and the rest would be lost, mostly from evaporation in the company’s cooling system, according to the application sent to Wisconsin officials. That amount of lost water falls below a daily limit of 5 million gallons that would trigger a review by other Great Lakes states, including those that lost out on the factory. Treated, sure, but not returned to pristine state I’m guessing. Ok, here’s a pretty weird story. The US started, then abandoned a top-secret military base under the ice of Greenland, called Camp Century aka Project Iceworm. The original goal was to have thousands of miles of underground tunnels and rail, and 600 nuclear missiles ready to be deployed against Moscow if they ever attempted to hack our elections. Ok, not that last part. But the tunnels, and nuclear weapons, that was real. The US didn’t even bother to ask the Danish government if it was ok with them to have nuclear weapons stored here, but in the end it didn’t matter because the ice turned out to be too unstable and the project was cancelled. Under the thick ice of Greenland, a scant 800 miles from the North Pole, the U.S. military built a hidden base of ice tunnels, imagined as an extensive network of railway tracks, stretching over 2,500 miles, that would keep 600 nuclear missiles buried under the ice. Construction began in 1959, under cover of a scientific research project, and soon a small installation, powered by a nuclear reactor, nested in the ice sheet. In the midst of the Cold War, Greenland seemed like a strategic point for the U.S. to stage weapons, ready to attack the U.S.S.R. The thick ice sheet, military planners imagined, would provide permanent protection for the base. But after the first tunnels were built, the military discovered that the ice sheet was not as stable as it needed to be: It moved and shifted, destabilizing the tunnels. Within a decade, Camp Century was abandoned. By the time the base was abandoned in 1967, it had its own library and theater, an infirmary, kitchen and mess hall, a chapel, and two power plants (one nuclear, one run on diesel). When the base closed, key parts of the nuclear power plant were removed, but most of the base’s infrastructure was left behind—the buildings, the railways, the sewage, the diesel fuel, and the low-level radioactive waste. In the 2016 paper, which Colgan worked on as well, the researchers suggested that the radiological waste was less worrisome than the more extensive chemical waste, from diesel fuel and polychlorinated biphenyls (PCBs) used to insulate fluids and paints. Overall, the researchers estimated that 20,000 liters of chemical waste remain at the Camp Century site, along with 24 million liters of “biological waste associated with untreated sewage.” That’s just at Camp Century; the military closed down bases at three other sites in Greenland, too, and it’s unclear how much waste is left there. Over the next few decades, the researchers found, melt water from the ice sheets could mobilize these pollutants, exposing both the wildlife and humans living in Greenland.